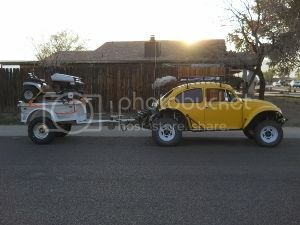 AzBaja.com, Home of the VW Baja Bug -:- Baja Forums -:- Off-Road & VW Based Clubs (4x4, ATV, Jeep, Motorcycle) -:- Events and Get Togethers World Wide -:- Official 2016 Hassaympa PlayDay Thread! Baja Forums -:- Off-Road & VW Based Clubs (4x4, ATV, Jeep, Motorcycle) -:- Events and Get Togethers World Wide -:- Official 2016 Hassaympa PlayDay Thread! Post subject: Official 2016 Hassaympa PlayDay Thread! Matt Martelli at MAD MEDIA is our first contributor. Thanks to Matt and the staff at Mad Media and the Mint 400 for all the swag! 24" will rule out 90% I did measure a bucket fer chits and giggles, there 15"" but it wasn't the official HD handy man Fred bucket. Opened the box and we have some really good stuff. DVDs, shirts/hoodies, stickers etc . . .
PLUS lots of posters to giveaway. Just heard back from Max Herndon at Rigid Industries Lighting. They are planning on putting together a few things for us to raffle off. Cool, Thanks for the hard work. Once it starts to cool down some I will get some work in on the Baja, I seem to have a lot more time than I did before. Hope/Plan to show up with a working Baja again will see. Post subject: Re: Official 2016 Hassaympa PlayDay Thread! Rigid will do what it can for the event! I wish I could make it out myself but the rail is still waiting for attention and I'll more than likely still be at SEMA, or on my way home. Well if you do get a chance Please stop by, there is always an empty seat. I always love this event. Lots of fun. And by the way no more pushing that stupid tire contest, it about killed me. I'm old but I hate to lose to some young punks, Pushed a little beyond my age. not a good thing. JWH and Dirtjunkie will be handling the event. I hear they have some really great contests lined up for everyone . . . or maybe they don't? We have few ideas already, but remember this is OUR event we are open to suggestions. the "tire push" is definitely a younger mans sport. I can do the "Hassampa River Run" again if you want. last year some fokes thought it was too short. [ Go to page: 1,	2	] 18 Dirtjunkie 6738 AzBaja Playday 2017?